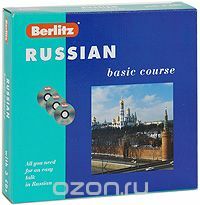 Когда товар "Berlitz. Russian: Basic course (+ 3 CD)" появится на складе, Вам придет уведомление. The presented course consists of 12 lessons (scenes). Each subsequent lesson is based on the material given in the preceding one. A lesson includes a dialogue covering one of the most common everyday life situations, appropriate comments to the dialogue, and exercises. Performed by native Russian speakers all dialogues are recorded on audio CDs. Complexity of the vocabulary and grammar material increases gradually, so that language skills are acquired easily. You don't have to drill dozens of grammar rules! Short comments given on margins clarify words and grammar structures used in the dialogue. You speak and master necessary grammar and vocabulary simultaneously. Without too much effort, you will be able to communicate with Russian speakers and cope with difficult situations. We hope you'll enjoy studying Russian with our course! Book that contains texts of dialogues, exercises, and simple comments on grammar. Three audio CDs with the recordings of dialogues covering more then 20 topics you frequently deal with in everyday life, such as greetings, asking or telling time, numbers and counting, currency exchange, asking directions, etc. Размер коробки: 22,5 см x 21 см.